This event was covered in the Oregonian the next day; see that post for more about the Microship lab quest that was just nearing an end. Scientist, adventurer and ultra-tech renaissance ham, Steve Roberts, author of Computing Across America, has managed to combine his love of electronic interfacing with a non-traditional work environment and spends his days biking or toting his vehicle around the country. Just call it ‘blacktop’ publishing on the BEHEMOTH. . . Big Electronic Human Energized Machine… Only Too Heavy. Inventor Steve Roberts will show us what its like to ride on the wild side with UNIXcycle through Macintosh, UNIX, and DOS environments. The bike’s speech synthesizer announces system events or incoming calls. The heads-up display shows a shimmering red scrolling map of Portland. The main display is a HyperCard graphic-user interface to the embedded control systems. The Megacycle Multitasking computer allows Steve access to CAD drawings, bubble-jet printers, high resolution displays driven by the Sun SPARC station, handlebar processors, LED diagnostic matrix, six level security systems, a satellite dish and a cellular phone! A thinking Man’s office on wheels! 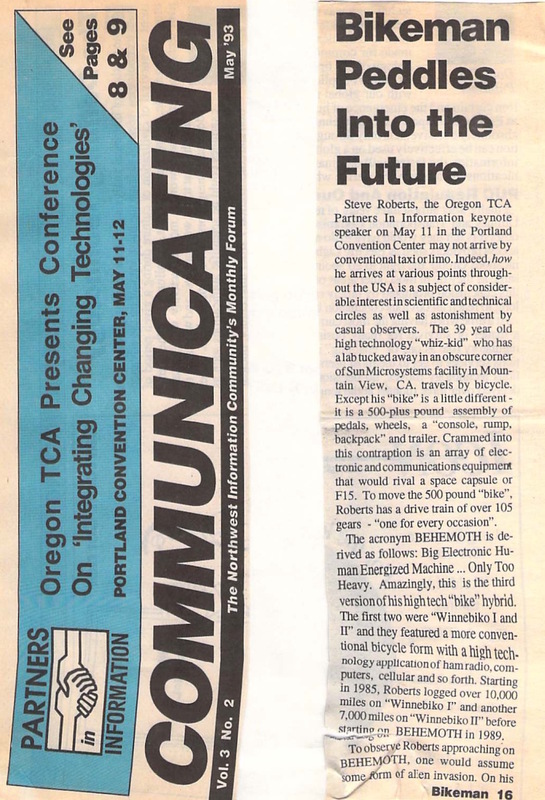 Steve Roberts, the Oregon TCA Partners In Information keynote speaker on May 11 in the Portland Convention Center may not arrive by conventional taxi or limo. Indeed, how he arrives at various points throughout the USA is a subject of considerable interest in scientific and technical circles as well as astonishment by casual observers. 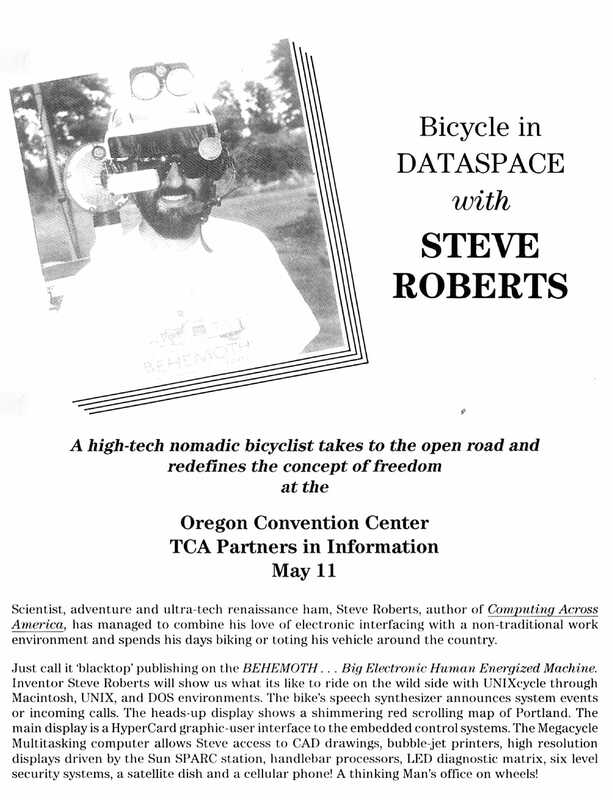 The 39 year old high technology “whiz-kid” who has a lab tucked away in an obscure corner of Sun Microsystems facility in Mountain View, CA, travels by bicycle. Except his “bike” is a little different – it is a 500-plus pound assembly of pedals, wheels, a “console, rump, backpack” and trailer. Crammed into this contraption is an array of electronic and communications equipment that would rival a space capsule or F15. To move the 500 pound “bike”, Roberts has a drive train of over 105 gears – “one for every occasion”. The acronym BEHEMOTH is derived as follows: Big Electronic Human Energized Machine… Only Too Heavy. Amazingly, this is the third version of his high tech “bike” hybrid. 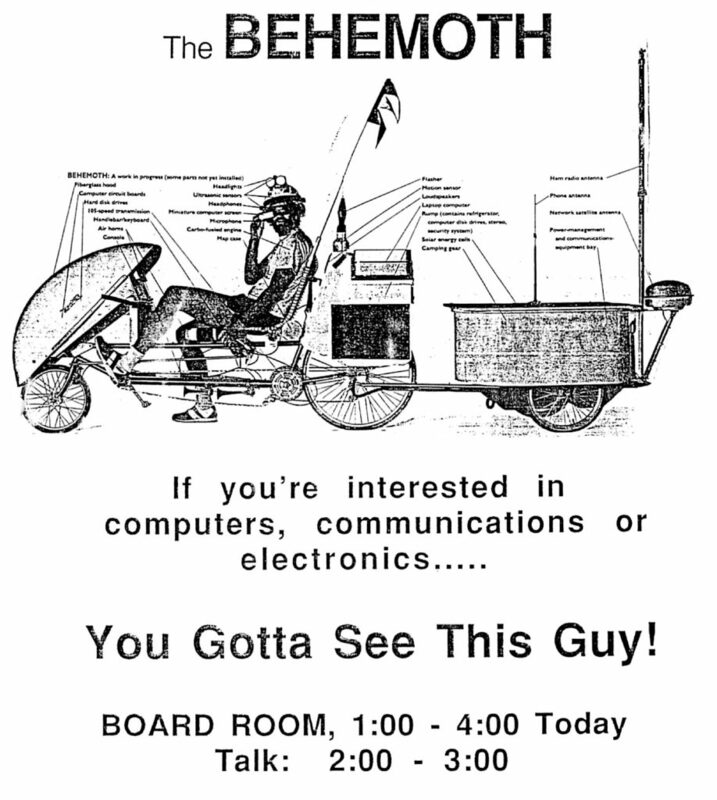 The first two were “Winnebiko I and II” and they featured a more conventional bicycle form with a high technology application of ham radio, computers, cellular and so forth. Starting m 1985, Roberts logged over 10,000 miles on “Winnebiko I” and another 7,000miles on “Winnebiko II” before starting on BEHEMOTH in 1989. To observe Roberts approaching on BEHEMOTH, one would assume some form of alien invasion. 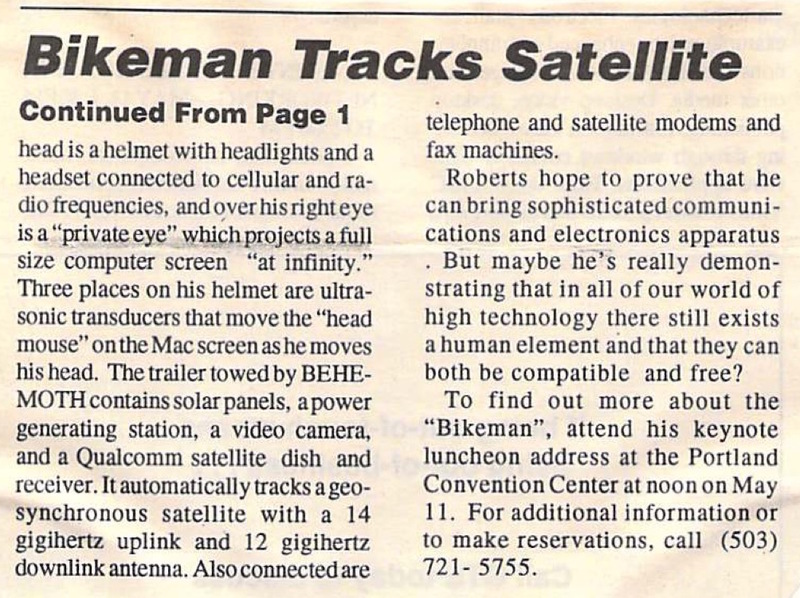 On his head is a helmet with headlights and a headset connected to cellular and radio frequencies, and over his right eye is a “private eye” which projects a full size computer screen “at infinity.” Three places on his helmet are ultrasonic transducers that move the “head mouse” on the Mac screen as he moves his head. The trailer towed by BEHEMOTH contains solar panels, a power generating station, a video camera, and a Qualcomm satellite dish and receiver. It automatically tracks a geosynchronous satellite with a 14 gigahertz uplink and 12 gigahertz downlink antenna. Also connected are telephone and satellite modems and fax machines. Roberts hope to prove that he can bring sophisticated communications and electronics apparatus. But maybe he’s really demonstrating that in all of our world of high technology there still exists a human element and that they can both be compatible and free? To find out more about the “Bikeman”, attend his keynote luncheon address at the Portland Convention Center at noon on May 11. For additional information or to make reservations, call [phone number redacted].